Fixing your car is easy if you follow these instructions. These instructions are not legal advice, and they are written as a guide on how to repair your vehicle when another person is at fault for causing the accident. WARNING: If you have been injured in a car accident, you should call an attorney immediately. DO NOT follow these instructions without first consulting with an attorney. You risk severely jeopardizing your case by making statements to insurance companies. They record every call, and just like the police say, everything you say will be used against you in a court of law. If you have been injured in a car accident, call my office for a free consultation at (916) 415-8911 before you move forward with any of these steps. Immediately after a car accident, call your insurance company and report the claim for car damages. The phone number should be on your policy or your proof of insurance card. Your insurance company will tell you if you have Collision Coverage and then they will give you a claim number. If you have Collision Coverage, usually you will have a deductible of $500.00 or more. Please note, that “Full Coverage” is a misnomer, and it does not mean that you have Collision Coverage. If your auto insurance company states that you have Collision Coverage, go to STEP 2. If you do not have Collision Coverage, or if you do not have auto insurance, go to STEP 3. California law allows you to choose any auto body shop you want to fix your car. Choose a company with a good reputation. Call the auto body shop first and make an appointment. Then take the car to the shop. Have the vehicle towed to the shop if it is unsafe to drive. Give the auto body shop your claim number, and your car insurance information, i.e. insurance company name, phone number, adjuster name, policy number and claim number. Pay the deductible, and let the auto body shop do the rest. Please note that your insurance company will attempt to recover your deductible and the money paid to fix your car from the insurance company of the Defendant. Ask your insurance company to waive your deductible and sometimes they will. Auto body shops are professionals at billing insurance companies. Let them do their job. The auto shop will correspond with your insurance company. 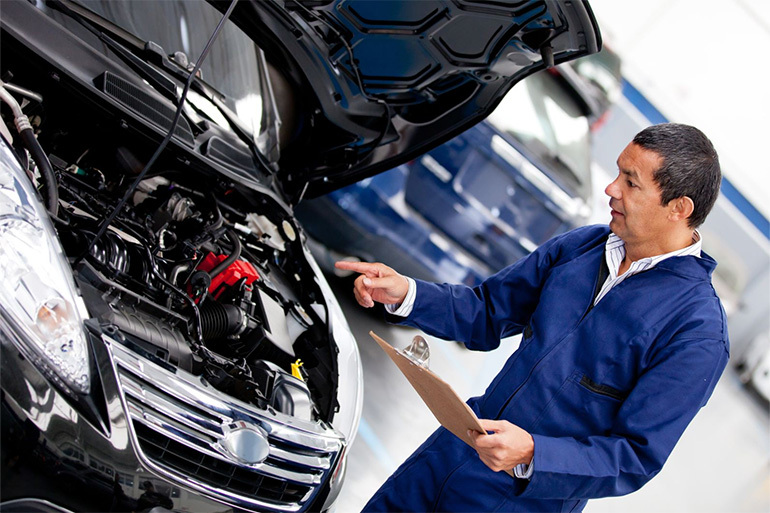 Ask the auto shop representative to explain to you their system. Sometimes, your insurance company will pay the auto shop directly, but sometimes they will issue you a check for repairs. In this case, endorse the check over to the auto shop for the repairs. Also, be patient and polite to everyone involved. Insurance adjusters can make your life easy or hard. When the car is ready, pick it up immediately. If your car is totalled and cannot be fixed go to STEP 5. If you do not have Collision Coverage, then the Defendant’s insurance company should be responsible for fixing your car. Call the Defendant’s insurance company and open a claim for property damage. Do not discuss the facts of the accident or your injuries with the Defendant’s insurance representative. Then go to STEP 4. STEP 4. NO COLLISION COVERAGE—CHOOSE AN AUTO BODY SHOP. CA law allows you to choose any auto body shop you want to fix your car. Choose a company with a good reputation. Call the auto body shop first and make an appointment. Then take the car to the shop. Have the vehicle towed to the shop if it is unsafe to drive. Give the auto body shop the claim number, and the Defendant’s car insurance information, i.e. Defendant’s name, insurance company name, phone number, adjuster’s name, policy number and claim number. Let the auto body shop do the rest. Auto body shops are professionals at billing insurance companies. Let them do their job. The auto shop will correspond with the insurance company. Ask the auto shop representative to explain to you the system. Also, be patient and polite to everyone involved. Insurance adjusters can make your life easy or hard. Allow insurance adjusters 24 hours to return your call, but be persistent and call again if you do not get a response. Please note that the Defendant’s insurance company should pay the auto body shop directly. However, sometimes the insurance company will issue you a check for the value of the repairs. In this case, endorse the check over to the auto body shop. If the auto body shop determines that your car cannot be fixed, it is a total loss, and you are entitled to the fair market value of your car at the time of the accident. If you have Collision Coverage, your insurance company will be paying you. If you do not have Collision Coverage, the Defendant’s insurance company is responsible for paying you. Research what your car is worth by looking in the newspaper, Kelly Blue Book, and online. Then begin negotiating with the appropriate insurance company. Once you are satisfied that the insurance company is agreeing with you as to what the car is worth, call this office to discuss the terms of the settlement. We will review the breakdown and assist you from there. Do not sign anything prior to discussing the paperwork with this office. Go to STEP 6. All insurance policies have limits and exclusions. Check your policy or call you insurance company to see if you have Rental Car Coverage. If you do, contact the same adjuster as before, and arrange for a rental car. Be sure to see how long you can rent the car for, there will be a limit for the number of days, and you will be responsible for paying overages. If you do not have Rental Coverage, the Defendant should be responsible for paying you for the loss of the use of your car. This means the Defendant or his insurance company should pay for a replacement car for each day from the date of the accident until your car is repaired or until you are paid for a total loss. However, the Defendant may not have enough money to pay for this, or the Defendant’s insurance may be limited, and you may not be able to recover the full value of the loss of use or the rental car bill. This is why it is very important to have Rental Coverage on your policy, as well as many other coverage to help protect yourself financially in times of an accident. Go to STEP 7. STEP 7. UNDERSTAND YOUR INSURANCE POLICY. “Full Coverage” is a misleading term used by insurance sales representatives, and as you may have found out the hard way, there is no such thing. Contact this office for a free consultation on purchasing insurance and on evaluating your current insurance policy. Learn how to understand and how to buy appropriate levels of Liability Coverage, Uninsured and Underinsured Motorist Coverage, Collision Coverage, Medical Payments, Comprehensive Coverage, Rental Coverage, Umbrella Coverage, and more. We will be happy to sit down with you and advise you on how to avoid insurance problems in the future.